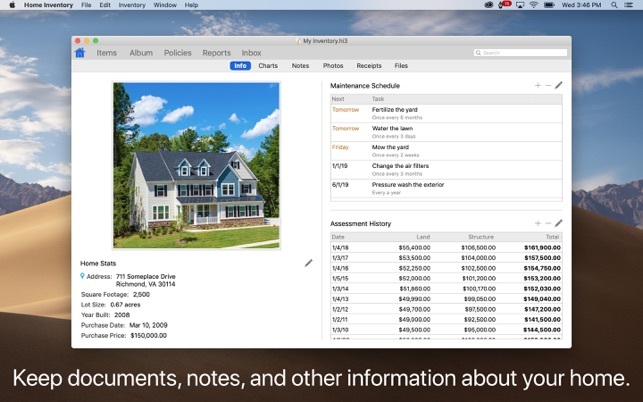 A Mac App Store Editor’s Choice, Home Inventory has been helping people around the world document their home & belongings since 2005. 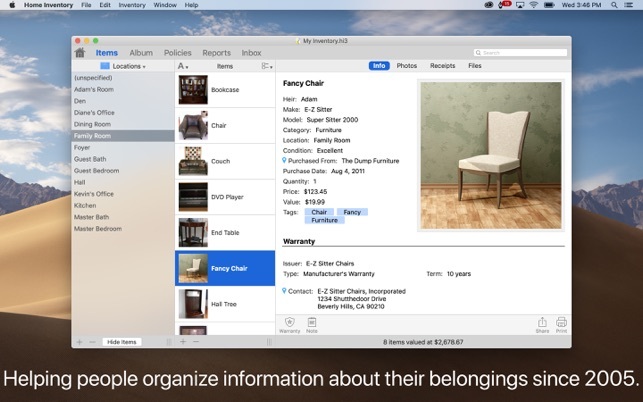 Called "Quick and easy to use" by the New York Times and a Mac App Store pick for “Best of 2013” by Apple, Home Inventory is the go-to tool for organizing details about your home and belongings for all your household needs. 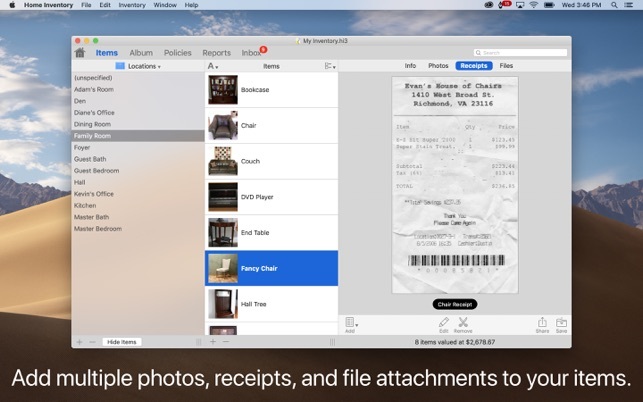 • Go paperless and store photos, receipts, product manuals, warranties, notes, and important documents for quick and easy access. • Coverage analysis lets you know where you are under or over-insured. • Policy support handles the complex coverage rules and limits found in most personal property insurance policies. • Share your inventory report with your insurance agent so you can determine the exact level of coverage you need. • Item reports can be used when filing a claim to help you receive a fair and timely settlement. • Create a home maintenance schedule that integrates with Calendar and Reminders. • Track important information about your home, such as square footage, purchase price, and property assessment history. 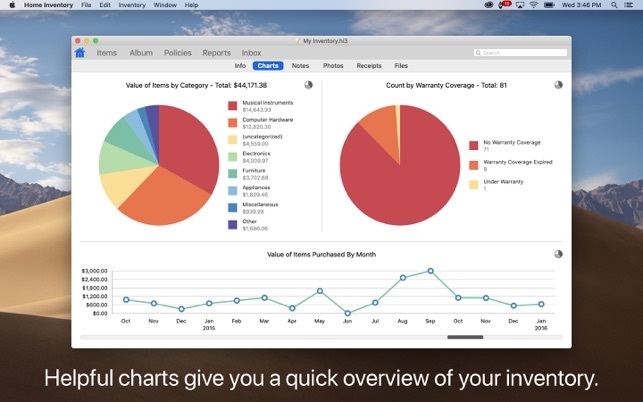 • See your overall inventory and purchase history at a glance with the Charts View. • Designate heirs for items you wish to pass on to loved ones. • Add the Heirs Report as an addendum to your Will. • Flexible enough for any type of collectible. • Home Inventory offers multiple ways to value collections. 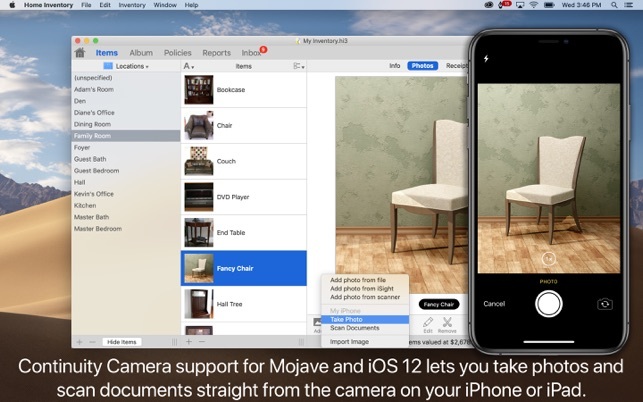 • Take photos and scan receipts directly to Home Inventory from your iPhone or iPad using Continuity Camera in Mojave and iOS 12. 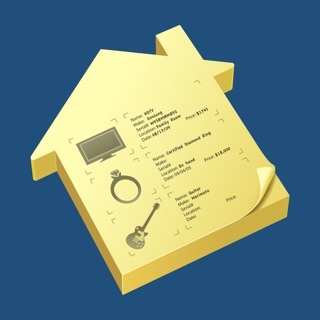 • Use our free helper app, Home Inventory Remote Entry, to add items from your iPhone or iPad device. 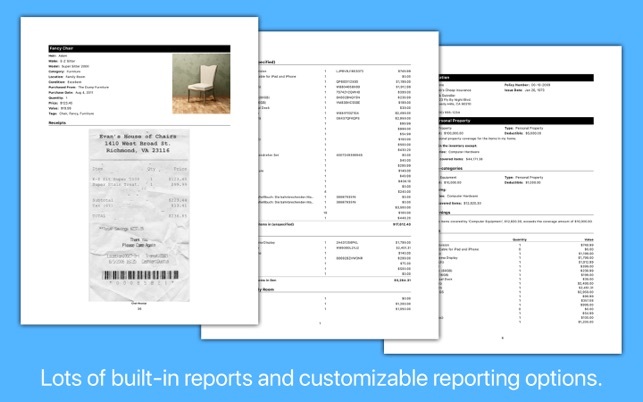 • Add receipts directly to Home Inventory's Inbox without having to open Home Inventory. • Your data is yours and stored locally on your Mac in a location of your choosing without the vulnerabilities of a web app. • Automatically back up your data to the cloud using a sync service such as iCloud Drive or Dropbox. 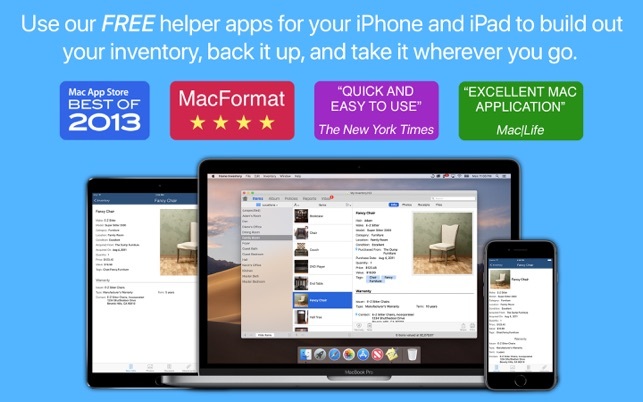 • Use our free helper app Home Inventory Mobile Backup to backup to your iPhone or iPad for safe keeping and viewing on the go. • Export to or Import your data to a standard CSV formatted file so it’s accessible from other applications. If you have any issues, questions, or comments about Home Inventory please do not hesitate to contact us at support@binaryformations.com. We are always working to improve Home Inventory and most of the changes and feature additions come from customer requests. If Home Inventory meets your needs and you feel inspired to leave a review or rating it makes a huge difference to us. Thank you in advance! Positive reviews, especially on the Mac App Store, are a huge help to small, independent software companies like ourselves. • Dark Mode support in macOS Mojave. 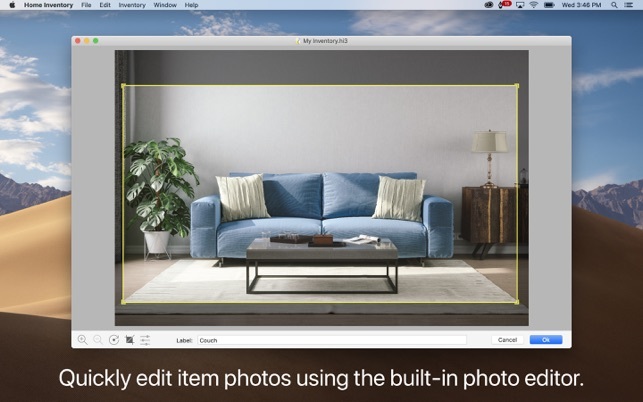 • Add photos and scan receipts from your iPhone or iPad directly into Home Inventory with Continuity Camera support (requires macOS Mojave and iOS 12). 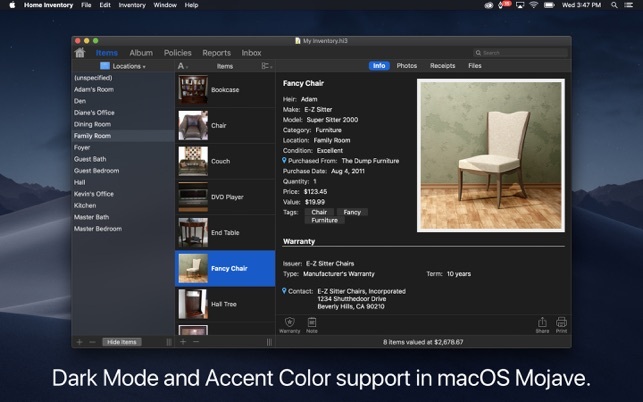 • Accent Color support in macOS Mojave. I looked into many different softwares, mainly for inventorying high-end art collections. Most of the softwares specific to this need are truly expensive ($250-$5000) or only available as a subscription service (I try to avoid subscriptions like the plague). It came down to Binary Formations Home Inventory versus Blue Plum Software’s Home Inventory. Both excellent, versatile softwares, for more than a fair price. Honestly, I like Blue Plum's design a little better, aesthetically speaking, but ultimately they did not have enough customizable fields for me, and I ended up switching to Binary Formations. There is a little bit of a learning curve involved. Not everything functions the way I would expect it to, especially in terms of shortcuts and workflows that one typically sees on the Mac. But overall, this is an excellent piece of software that is very versatile, can be customized, and includes all the major features that I’m looking for, including remote entry on iPad and a light version for viewing on iPad. I am still navigating my way through the interface, so I’m not completely versed in it yet, but I’m very pleased with what I have been able to do in a short time and the logic and versatility of the system. I believe this software will only get better as the developers continue to work on it and add features. I have contacted them a few times now, and they are extremely responsive. This alone is well worth it. The thing about home inventory apps is you want it to last for the long haul as it is a big project to initially get it done and then it needs updating over the years. This app has been working and inproving for me since 2011. I recently reopened the inventory file and could not back it up as I had changed computers, changed where I stored the back up (different places on dropbox) etc etc. Yesterday I sent an email to customer service at 11:31pm to see how to get back updating and backing up. At 7:59am the next day I had simple instructions on how to resolve the issue. ("To fix this go to Preferences under the Home Inventory menu, then click Backups at the top of the preferences window. Either un-check and re-check the backup option or click Change Backup Folder and select the folder you wish to backup to and you should be okay from then on. "- duh). Big thanks for continuing to improve the app so I can continue to create a more accurate inventory of my house. 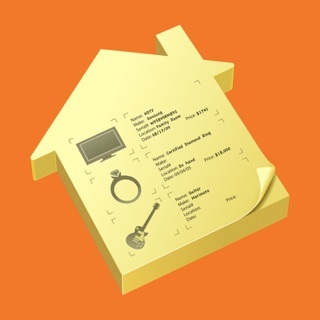 I’ve been a fan of Home Inventory for several years and have painstakenly entered my collectible inventory item by item with pictures, scanned receipts and descriptions. I had over 300 items in the system and really felt good that it backed up things whenever I closed. HOWEVER, that ended with this latest update. When the company pushes out an update, they don’t give you a choice of whether to use the current version or to update to the newer version. I went through the prompts on the screen and updated like I had in the past versions, only this time it LOST 3/4 OF MY INVENTORY! When the updated version opened, my categories were there, but most were EMPTY. Over 200 entries were missing. :( I almost cried because this had taken me years to compile!! I tried importing from a back-up and it says I don’t have permission? All I can say is that you need to be VERY cautious if you’re going to invest time with this program and be sure to create a separate back-up to your computer, not the App back-up that happens when you close it out, because it is NOT reliable! It sounds like the "Only show collected items when viewing by collection" option may be set in Home Inventory's preferences panel. This option, which is off by default, helps keep the item list uncluttered by when browsing by location, category, etc. by filtering out items that are a part of a collection when it is enabled. If this option is unchecked or if your items don't reappear when you uncheck it, please contact support and we will do our best to find and fix the problem.